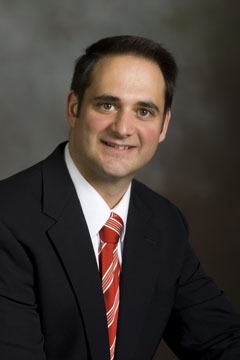 Vincent Magnini, assistant professor of hospitality and tourism management, specializes in research in services marketing. BLACKSBURG, Va., Nov. 23, 2010 – Vincent Magnini, assistant professor of hospitality and tourism management in the Pamplin College of Business, has received a $75,000 award from the Virginia Department of Conservation and Recreation to analyze visitor satisfaction in each of the 35 state parks over the next five years. Magnini says his study will assess all major dimensions of visitors’ park experiences. His research tools will include data mining techniques “to detect non-obvious, yet managerially relevant, patterns in the data.” He will provide regular feedback to the Virginia State Parks Division regarding the performance of each park, along with an annual report. Magnini’s previous marketing-related projects for Virginia State Parks have included participation in a statewide pricing study, Rails-to-Trails feasibility research, and a couponing experiment for parks with swimming areas. Focusing on research in services marketing, Magnini investigates communications between managers and potential customers, connections between managerial behaviors and frontline employee performance, and interactions between frontline employees’ actions and customer responses. He teaches courses on hospitality and tourism marketing and service management. He serves on the editorial boards of Cornell Hospitality Quarterly, International Journal of Tourism Sciences, Journal of Hospitality and Tourism Research, and Journal of Vacation Marketing. Virginia Techâ€™s nationally ranked Pamplin College of Business offers undergraduate and graduate programs in accounting and information systems, business information technology, economics, finance, hospitality and tourism management, management, and marketing. Pamplin emphasizes technology and analysis that improve business, entrepreneurship that leads to innovation and innovative companies, international opportunities for learning and research, and an inclusive, collaborative community. It is named in honor of two alumni: the late Robert B. Pamplin, retired chairman of Georgia-Pacific, and businessman, author, and philanthropist Robert B. Pamplin Jr.